EGYPTIAN RAILWAY - railmeds JimdoPage! The railway sector plays a significant role in the Egyptian economy. However the total Rail freight volume has been decreasing strongly from 4,064 Mio. tkm in 2005 to 1,592 Mio. tkm in 20099. Main goods transported are iron, charcoal, petroleum, commodities, phosphate, wheat and containers. International freight transport on Rail does not exist, as there are no railway connections to the neighbouring countries. population, even relatively small population centres are served by minor lines. length of the electrified network is 574 km (6% of the total network). _ The whole network uses standard gauge of 1,435 mm. _ About 15% of Egyptian National Railways' (ENR) network is equipped with colour light signals. 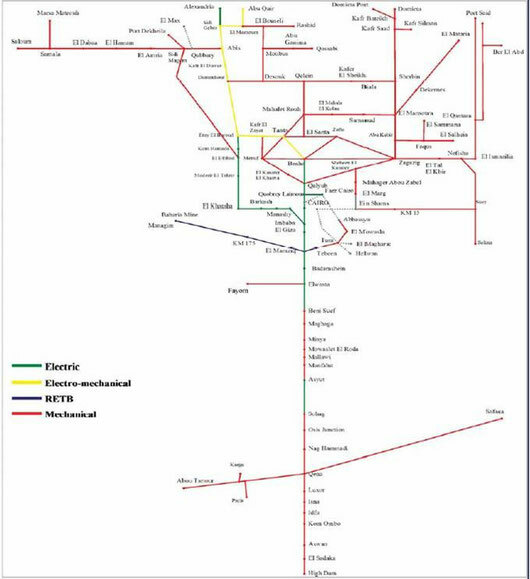 _ There are no high speed lines within ENR's network and the maximum speed on the network is 140 km/h. _ About 15% of the network is equipped with Relay Interlocking; the rest is equipped with Mechanical Interlocking. - About 10,696 goods transport wagons. Egypt follows the European standards when electrifying the signalling system, and in the fields of interlocking, power supply and telecommunication. Egypt would also like to implement the Abu Tartour – Qena – Safaga corridor as a dedicated freight corridor, with a length of 680 km. The aim of this corridor would be to improve the transport of phosphate from the mines to the export ports. ENR is the national railway company. Rail infrastructure is owned by and rail services are provided by ENR. ENR is a public entity created in 1980 reporting to the Ministry of Transport (MoT). _ ENR should implement the projects necessary to achieve its objectives. System for the Regulation and Management with the decision No. 417 of 2007. The ENR transformation program is an ambitious five year program which commenced two years ago. - Infrastructure unit to operate, maintain and renew the network. _ Subsidiaries have been created to enable greater focus on selected activities. _ Implementation of the Rail Safety Regulator, an entity within the MoT tasked with monitoring and investigating all safety relevant aspects of ENR. _ New safety organization structure within ENR. _ Improved signalling as priority upgrades to four corridors. _ ERMAS: a new company created for the rolling stock overhaul has started its activities and has been achieving its targets since February 2008. _ IT: ENR is planning a major upgrade of its IT systems allowing for a more efficient and timely management of the company. This was launched in May / June 2008. _ The focus has been in the past years on reducing the level of fare evasion throughout the network through increased on-board controls as well as controls in stations (station close offs). which are monitored on an ongoing basis. _ The Italian government provided eight million Euros for the recruitment of a complete management team comprising ten qualified managers to assist ENR in its transformation plan for the forthcoming years. _ Establishment of Railway Safety Regulatory Unit. Establishment of an independent Accident Investigating Body (completed by 2009). - Level crossing upgrades: upgrading of around 700 level crossings within the coming two years of which 345 are supposed to be completed in the first year. - Start of the station improvement. - Locomotive availability: the arrival of new 120 locomotives of which 90 were to be available in the 1st half year of 2009. - With the arrival of the new locomotives in the 1st half year of 2009, focus will be set on preparing and ensuring an increase in transported freight volume. - Discontinuation or compensation for concessions (PSO). - An initial review of the different concessionary tariffs has already taken place in the past year. and Insurance of the Transport Safety of the Railways” through the twinning project. In 01.01.2008 according to the restructuring plan of the railways; the unit “Safety and Risk Management in ENR” has been established. _ Initial report after the accident with the participation of all departments. Detailed description of the accident and the initial assessment of the causes, damages and delays. _ The Unit “Safety and Risk Management” as well as the “Unit of the Safety Regulatory” of the MoT shall undertake accident investigations on the main lines and the accident hot spots. There is no proposed regional rail (freight) corridor yet. Due to the special geographic and political situation establishing an international freight corridor will be difficult. However, a corridor to Jordan could bring major benefits to the region. Benefits could be gained by introducing an additional reliable transportation route and linking Egypt to the planned Arab rail networks. independent national railway safety authority.